Another round of C88 opened today and the theme is Moody Blooms. I wanted t show this dress from Bueno – which reminded me of happier days set in the spring. It is playful and shows a bit of skin and dips low in the back. This hair is available at Collabor88 from Tram. Rewind is just a day away. I’m pretty excited for some of the stuff that I’ve seen and I’m feeling pretty nostalgic. I was a kid in the 80’s and I’m seeing a lot of really cool things. 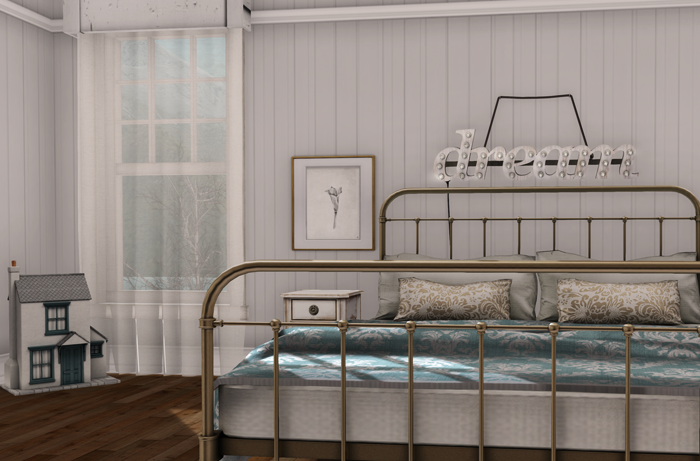 One of those cool things is a brand new furniture store that is opening up and I’m really liking what I see so far, that store is VOID and it will be making it’s premiere at Rewind on May 10th. Stay tuned, I have a feeling that VOID will have some very cool things. Hi! I just wanted to do a little post featuring some of my favorite Collabor88 items – that you still have a chance to go and grab at the event. Happy Shopping! It’s Monday, and tomorrow is Valentines Day – do you have any plans or a special Valentine? Maybe this flowery and sheer lingerie from Erratic can be something special that you’ll wear. Collabor88 is covered in flowers this month, Anc made these pretty white roses that are blooming all around me. I’m also wearing hair from Little Bones that is also at Collabor88 called Free. I figured I would put up an outfit suggestion from my recent trip to Collabor88. I feel that these sparkle leggings and silky top would be perfect to bring in the New Year! The outfit is from Stories & Co. by Flowey and it comes in many more colors. The hair is from Little Bones, and is called Mara, and my sparkle necklace is from Yummy. It’s be a few days since Collabor88 has opened, so chances are you have a good shot of getting in now! 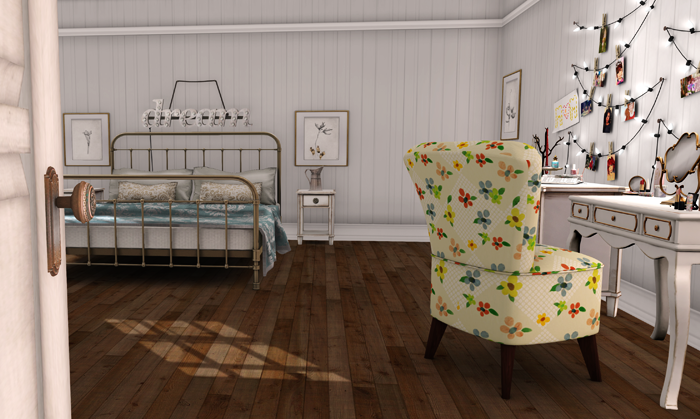 I finally got my bedroom shaped up how I wanted it and wanted to show this very pretty bedroom set from Apple Fall and Scarlet Creative (who did the Wardrobe and Stool) which you can still get at Collabor88 for about another week or so. The bed is beautiful and I love the soft look of the covers, the dresser and night stands to the dream sign over the bed and doll house complete with the botanical pics are just perfect to me. I love these pieces that really make your Second Life Home complete. I also used things in the photos not at Collabor88 from Trompe Loeli, Tres Blah gacha vanity stuff, and emm shop (the little craft cabinets are new and adorable) I hope you like my bedroom!